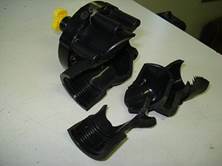 An improperly winterized valve can suffer serious damage. To minimize the risk of freeze damage to your irrigation system, you'll need to "winterize" your irrigation system. The time to winterize your sprinkler system is after the irrigation district turns off the water (if your system is attached to irrigation) or around the average first frost date. The Old Farmer’s Almanac helps identify your area’s average first and last frost date here. In the Treasure Valley, Idaho area the average first frost date is October 1 – 10. 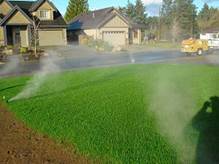 Irrigation systems in areas where winterization is mandatory are installed using one of three types of water removal in mind: manual drain, auto drain, or blowout. If you don't know your system type, it would be best to use the blowout method. Contact us here or call 208.477.4101 to schedule your sprinkler blow-out before freezing weather arrives. Prices start at $35 for the first six zones in a standard pressurized irrigation system*. While we’re at it, we can put your lawn to bed with a winter fertilization. We do not recommend winterizing your own sprinkler system unless you are completely familiar with all shut-off valves, backflow device, blow-out ports, extra lines or faucets, or any other unique features that were installed onto your system. Let Impact Excavating do it right the first time! Each spring we repair a number of improperly winterized sprinkler systems. The damage is discovered when the system is activated and the homeowner’s repair cost is usually no less than $200 and has been up to $700. So, while you may find a cheaper “blow-out” service this year you could find yourself paying more next spring to repair system damage caused by freezing weather or a careless blow-out provider. Since we install sprinkler systems, we know how to avoid the damage in the first place. Hiring a professional blow-out service may not be "cheapest" today, but in the long run you will find you have received a very good value for your money. This RainBird newsletter on winterizing provides more technical data for those who want more information. *$5.00 per zone after the first six. Call to discuss pricing to winterize backflow devices and irrigation pumps.